This is a goose free cruelty article, but summarises the behaviour of two of the main protagonists in the cull of Sandwell’s geese. The one is an ex parks manager, whose biased report appears to have led to the culls in 2013 and 2014. The other purported to lead Sandwell council and had ambition to become the metro mayor of the coined “West Midlands Greater Authority” before his death in April 2016. This post summarises the bonfire event which took place in Brunswick Park in Wednesbury in 2014 and the subsequent events where members of the public were injured by a so called “stray firework” – that being the tagline that Sandwell council and its leader were happy to promote in the media, until a freedom of information request revealed significantly more about the organisational shambles that was operating on that fateful night. Though he was lauded in eulogies by the political class and his friends in the media, Darren Coooper was a deeply unpleasant man in life. Not only was he involved in a long social media trolling campaign with others against a Birmingham woman whose husband had began to expose the institutional Council corruption rife under his leadership, but he looked after those around him , seemingly unable with the Chief executive, Jan Britton, Monitoring officer Neeraj Sharma and audit risk manager Peter Farrow, to detect any of the activities of fraud and corruption and wrongdoing occurring at the authority, not least of his own then Deputy. If it hadn’t been for Julian Saunders’, “Sandwell Skidder blog” , it is unlikely that any of the wrongdoing would ever have come to light- especially when the mainstream local media danced to his tune and his thuggishly tribal football firm analogies and West Bromwich Albion, an organisation he gleefully boasted about ripping off as a child by sneeking into the ground. I could write much more, but I’ll leave that to Julian Saunders, though perhaps all you need to know about Darren Copper, the man the myth, and his intellect can be summed up in his own posting below. You are as they say “what you eat”. Fuel, bangers, mash… to continue the bonfire leitmotiv. 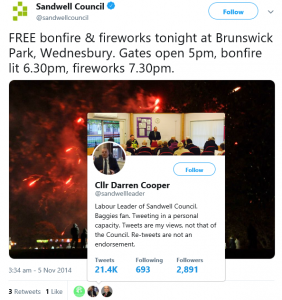 Sandwell Council actively promoted the 2014 “free event” on social media at the Wednesbury park leading up to the night in question. This is perhaps where the planning went out of the window, as well as several thousand pounds up in smoke. The council also put out this gem on twitter. Perhaps PROBAN overalls , Kevlar vest, gloves and helmet should also have been advised! 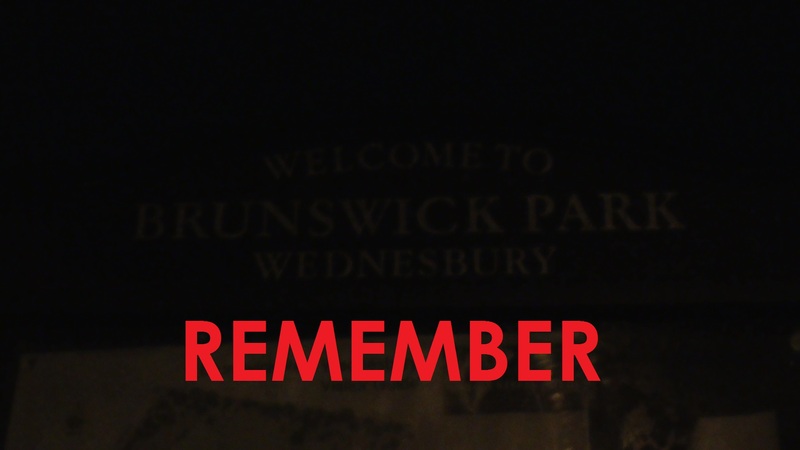 The following story concerning the Brunswick Park event and aftermath appeared in this BBC new article the following day. It was reported in this article that three people had been injured with others treated for minor panic related injuries. 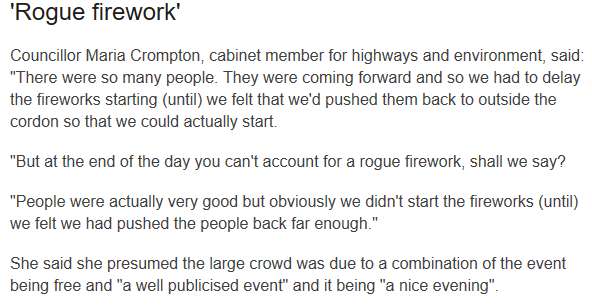 Another BBC article from the same day reported that the crowd had been “double that had been expected”. It also quotes then Cabinet Member Maria Crompton. We see here then the threads that Sandwell council would attempt to present in subsequent media interface. That it was all down to a “rogue firework” being to blame. Both of these statements were later revealed to be extraordinary lies. 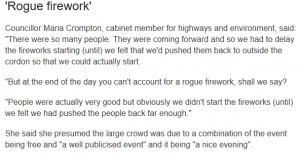 You can account for a “stray firework” by ensuring the crowd are not within the safety zone, and as will be demonstrated, that is not what happened on the night, and it would have been known to staff and councillors that this had been the case. But who briefed the cabinet member to state such lies? The Express and Star article of the 7th November then focussed attention on a “probe” into the event and the cause of the incident. 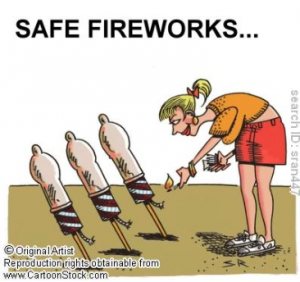 “She said: “If you get a rouge (sic) firework, what can you do. There were a lot of people there but even if it had been 1,000 in the crowd you can still get a rouge (sic) firework. As will be evidenced, there was very much that Sandwell council could have done to prevent this incident from ever happening in spite of “rogue fireworks”. Two further Express and Star articles gave the human impact story of those actually injured, and the fiasco of the event by now was starting to unfold on social media about the organisation, the enormous crowds and the fact that it was a free event that had been atrociously planned. 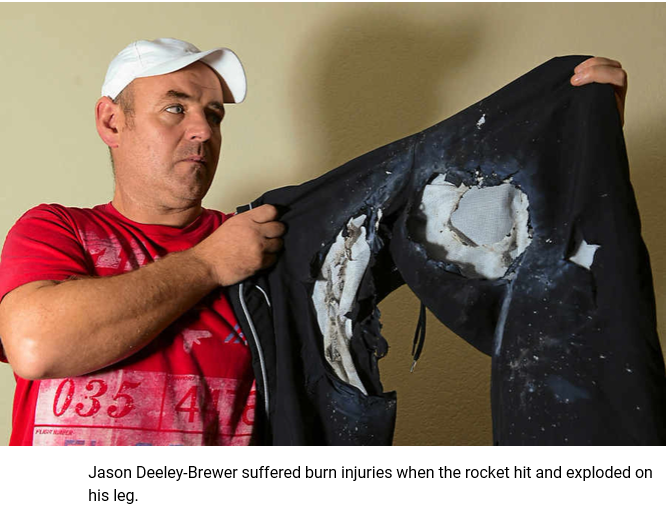 The article of 8th November Wednesbury firework victim tells of horror, tells the story of Jason Deeley-Brewer who was burnt by the firework. Mr Brewer, who needed hospital treatment accused the council of failing to protect the public, and this claim would be proven correct in the subsequent investigation. 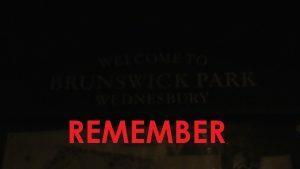 “said her daughter had been traumatised by the accident at a packed Brunswick Park in Wednesbury when a stray rocket veered into the 12,000-strong crowd and struck her. Nothing further appeared in the press until the following month, but by this time, rumours had began to filter out of the event, and from within the council itself as to who had been responsible for the fiasco taking place, as well as giving the order for the fireworks to be let off, despite the crowd being too large to accommodate the venue safely. 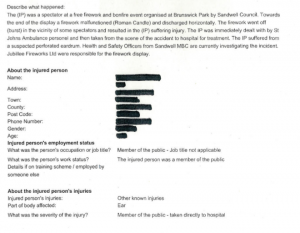 By this time Sandwell council had as required reported the matter to The Health and Safety Executive, though with incomplete details as to who had been injured. I requested this information via the HSE, and they supplied the following RIDDOR form submitted by the council, which clearly shows only one person being injured. “Reporting of Injuries, Diseases and Dangerous Occurrences Regulations 1995 (RIDDOR). Unfortunately RIDDOR is a rather rudderless measure of accidents given that it only requires reporting of the most serious types of injury or death. It does not however discharge Sandwell council and the firework company from negligence under The Health and Safety at Work Act 1974, as will be evidenced. 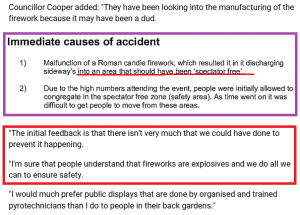 In the form it states that a roman candle malfunctioned, and that Jubilee fireworks were “responsible for the firework display.” The dishonest liar who completed this form negated to mention anything about organisation of crowd safety or that the crowd were within an area too close to the display. The council officers and those in senior positions were well aware that more than this number had been injured, in fact their own employees had. With at least two threats of publicised legal action, the council then appeared to go on the offensive, trying to build on the mythology of the “stray firework”. In the article of 27th December, The Express and Star give Cooper free reign to promote this lie without question. What we do know is by this time, and very quickly after the event, it was apparent as to which officer of the council had made the decision for the event to go ahead and that he had overruled the firework organisers in doing so. 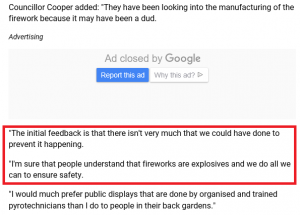 It appears that this tactic of “the stray firework” was an attempt by Cooper to blame the firework company and even manufacturers of the roman candle article rather than his protected officer. At this point, this lie became a conspiracy and plot to deny the truth. All then appears to have gone quiet, with no news stories about anyone taking legal action, nor of the investigation that the council had claimed to have been investigating. Of course, any reasonable news organisation or journalist would have asked to see the council report to verify the voracity of claims being made by leading councillors happy to blame “stray fireworks” ,and by implication the event contractors Jubilee fireworks, rather than themselves, and specifically the man that they were protecting from scrutiny. On 10th September 2015, The Express and Star published another article , this time focussing on the event moving away from the venue of Brunswick Park which was suddenly no longer big enough to accommodate the crowds. It is clear at this stage that the investigation must have been finalised, and that one of the recommendations within it was the reason why the event was being pulled in 2015. We once again see Councillor Costigan quoted making a misleading statement, leading towards the firework and away from the reason why the firework had reached people. Garbage, it could have been prevented, as the report states. A further article appeared in The Express and Star following the 2015 Dartmouth Park event, which was again marred by organisational problems and yobs throwing their own fireworks at another free event. Again the mythology of “the stray firework” was repeated. By this time, I had been given specific information by informants within Sandwell council and what had really happened that night in 2014 in Wednesbury- a far cry from the lies issued by councillors that had been given space within the local newspaper without checking for accuracy. I submitted a freedom of information request to Sandwell council, asking for the Sandwell council report. Specifically I asked. “(ii) It is alleged that several calls were made on the public address system before the fireworks were set off with a delay of 20 minutes. Can you confirm that this was the case, and therefore on whose instruction on the night the firework display was told to commence? Which officer of the council gave the nod to commence the display on the night? (iii) I am requesting any recorded information that you hold where any officer of the council admitted making a decision to proceed with the display despite the safety concerns. The council were then forced to release the report. The first thing to note about the report is that its author Chris Williams “Senior Lead Officer (Health and Safety)” had completed it sometime in November of that year. It is therefore apparent that when Cooper was quoted in The Express and Star article of 27th December that he would have had FULL knowledge of this report and conclusions. The witnesses to the event are listed as follows. Witnesses: Mark Bowhay, Wayne Chattin, Kayleigh Love, James Piggott, Christopher Jones (Wardens). Sunish Patel, Tony Potter, John Satchwell. All of those listed as witnesses were employees of Sandwell Council. Specifically at this point in time, they also including the warden service were managed by John Satchwell– parks manager. Why there were no independent witnesses to the event, and why their input does not appear to have gone into this report remains unclear? This automatically has to ring alarm bells in that if all of these individuals were managed by the same individual, and the one who had a pivotal role in the disaster that unfolded , then there may well have been pressure to agree on a specific story, which may not have been the one that happened. Where were the firework staff, the injured parties, the St John ambulance staff who treated them, as well as several hundred members of the crowd who must have seen something? One has to ask from this statement if these “informal meetings” really existed at all ? Why would it not have been forwarded to the investigator as key evidence ? 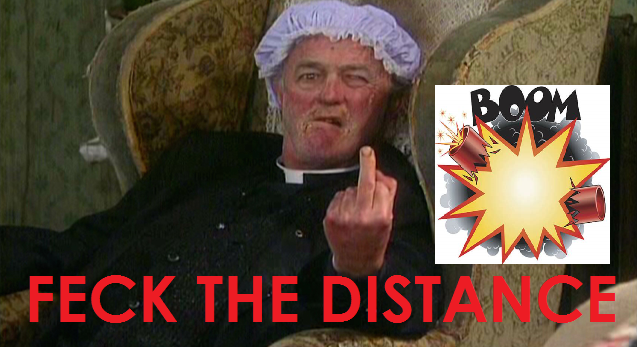 So now the council even desperately attempt to blame the radio station! He had no business as an observer intervening in this event. That is where the whole report starts to unravel and the event descend into chaos. We then have several unsubstantiated statements blaming the people who had been invited to this free event. Remember they had paid nothing to turn up and gain entry, they had lost nothing in being there. This appears a direct attempt to present mitigation for an unprofessional decision being made. This key statement about John Satchwell’s key intervention is the whole reason why this firework display took place, despite the firework staff being effectively overruled by him to “let them have it”. He had no business making this decision as he was not part of the events management. 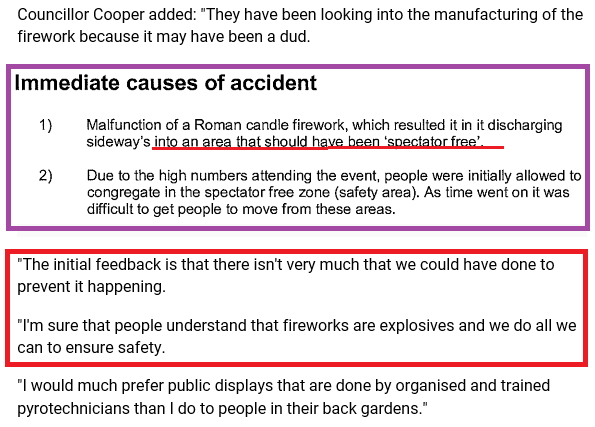 The key statement about him “taking responsibility for what happened” means that he would take responsibility for ignoring the advice of the firework professionals, aware that they were being pressured, not least I have no doubt by Satchwell to ignore key legislation about health and safety at such events. The distance of 41 metres is key. 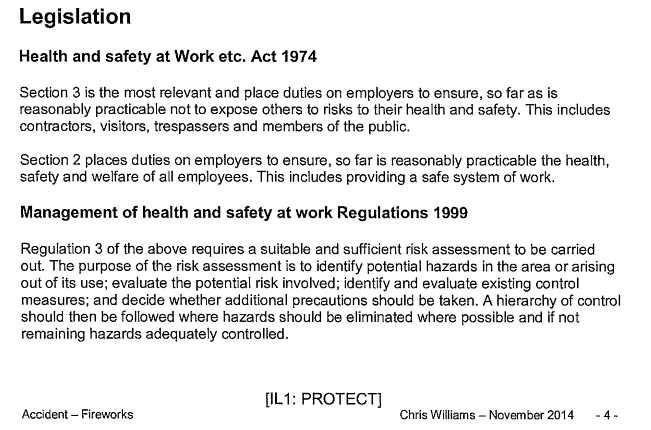 The report mentions The Health and Safety at Work Act 1974, as well as two published guidance manuals for managing such events. These two documents can be downloaded below for clarity. This therefore confirms that people were struck within an area in which they should not have been, and that the display took place despite the organisers and Sandwell council being aware of this- a far cry from the initial pack of lies about the stray firework. Of course, this then means that the council admit to not adhering to practices under The Health and Safety at Work Act 1974, and by this admission, they should have been expected to face legal action. The report however chooses to ignore other statements made in the HSG guidance manual such as the following paragraphs. This is by no means an exhaustive list , but ones in which Sandwell council failed on the night in question, but omitted from Chris Williams report. • What is the expected size of the audience? Sandwell council failed in its responsibilities by failing to undertake this advice and by failing to identify the size of the audience. They also failed to ensure safety by lighting the bonfire before the display, thus pushing the crowd back. Sandwell council failed in its responsibilities in that some random bloke popped up from the crowd taking over with no defined role. Sandwell council failed in its responsibilities by failing to prevent spectator access by failing to form suitable physical barriers. Sandwell council failed in its responsibilities by failing to ensure that all spectators at larger displays could here instructions and announcements. 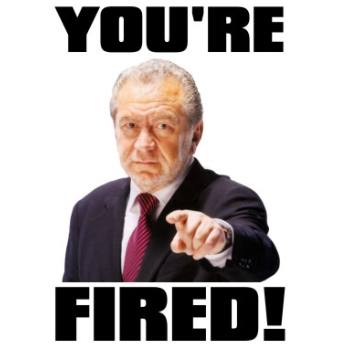 Sandwell council failed in its responsibilities by failing to adhere to a chain of command. Sandwell council failed in its responsibilities by failing to keep spectators out of the safety area. They failed to control entry into the spectator area. “What if something goes wrong? Plan in advance! 54 Well before the day of the display, you will need to consider what could go wrong on the day. Draw up a plan to deal with each emergency or contingency, answering the questions ‘What action will be taken?’ and ‘Who will take that action?’ Involve the display operator in this exercise where necessary. 61 If spectators break through the barrier into the safety, firing or fall-out areas, ensure that firing of fireworks stops as soon as is practicable. 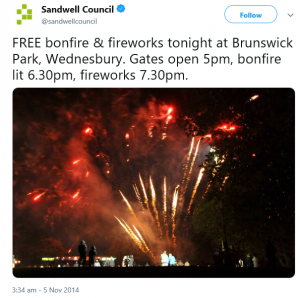 Sandwell council failed in its responsibilities by failing to stop the firework display when it was fully aware that the area had been breached. It commenced the display in disregard for this. Sandwell council failed in its responsibilities by failing to call the police. There is no mention of anyone calling the police, not least because of the alleged “threats and intimidation”. Of course, these may not even have happened, we have to take the council’s witnesses words for it! There are multiple failures in the risk assessment process and the HSG154 GUIDANCE. The council failed in managing overcrowding, failing to anticipate crowd numbers, keep records and adhere to The Management of Health and Safety at Work Regulations 1999. The report itself concluded the following about the cause of the incident. After the publication of the FOI request, The Express and Star finally redeemed its credibility by reporting on the facts of the case, rather than the lies of councillors and that an officer of the council had been “responsible” for allowing the event to continue despite knowing the dangers of doing so. The following post on a firework forum about this event , perhaps sums up perfectly the essence of the case. But Cooper’s protection of John Satchwell was not just motivated about protecting a council officer from blame, who was to blame and who had “accepted responsibility”, no, it was because Satchwell himself was a member of the Tipton Green Labour party. It was for this reason, a fully complicit attempted burial of the truth to hide behind “the stray firework” mantra, and all those officers and Labour councillors who took part in it after the council report had been written and the facts established are not only dishonest liars of the worst kind, but they were also attempting to prevent legal action being taken against the council. 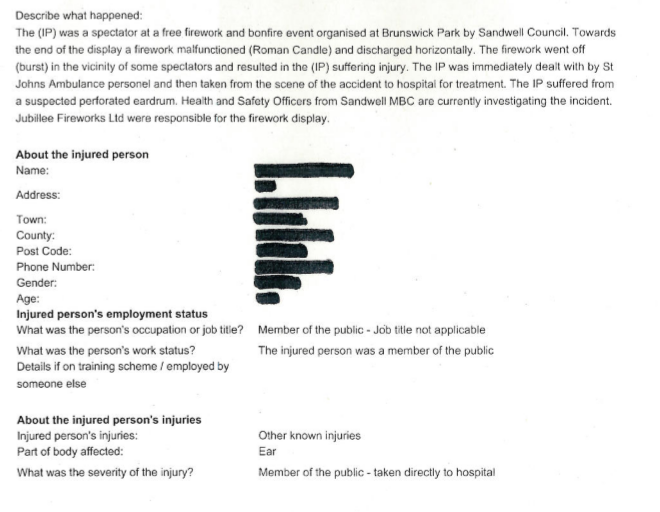 It is worth stating that if this FOI request had not been submitted, then Cooper, Satchwell and co would have escaped any real scrutiny of their and Sandwell council’s actions that night and that blame would have been put down to a “rogue firework”. 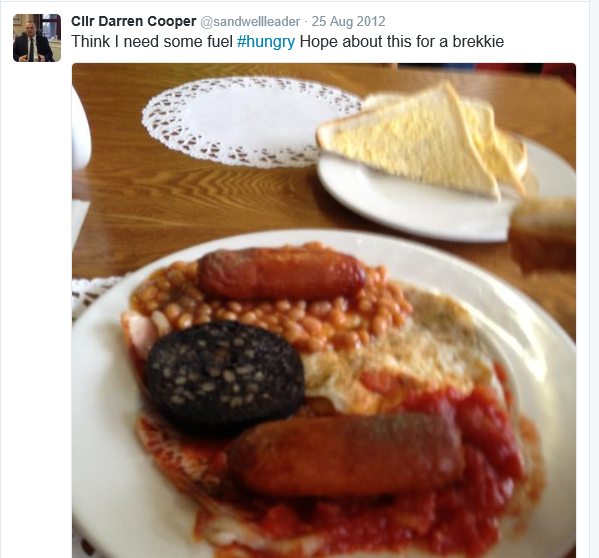 Indeed this is just one example of a veritable selection box of stories occurring in Sandwell council whereby things were covered up or evidence distorted to protect those close to Darren Cooper, and all apparently under the noses of the senior officers and directors. One can only now be grateful that this poor man’s peaky blinder Mafioso is no longer in control of Sandwell council, but unfortunately the legacy burns on with an eternal flame of idiots still in post and those who choose to look the other way when something goes wrong. The council had to call in RoSPA when it all went pear shaped again with a free display in Dartmouth Park in 2016 amidst widespread criticism; they clearly had learnt very little from past events. The RoSPA report is notable for mentioning aggressive security guards and swearing DJ’s- remember the witnesses at the 2014 event saying similar things about the crowd?